Congratulations to ELPH co-PI Trevor Hancock who received the R.D Defries Award! This is Canadian Public Heath Association's highest honour. "Arguably, no individual Canadian has done more to advance the public health importance of the ecological determinants of health." CPHA 2017. At CPHA 2017, ELPH was very well-represented! We co-hosted a pre-conference workshop and a health equity tools workshop, presented six oral presentation and one poster! Equity Lens in Public Health is a 5-year program of public health research at the University of Victoria. Find out more: ELPH research program. We are pleased to present our second inventory of health equity tools (pdf). Check out our selection of KTE resources here. 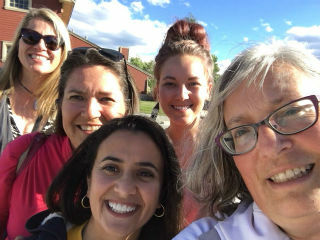 Part of our research team in beautiful Cranbrook, BC after a day of research planning with the Ktunaxa Nation Council’s Traditional Knowledge and Language Working Group for the CIHR-funded xaȼqanaǂ ʔitkiniǂ (Many Ways of Working Together) Research Project that was inspired by ELPH findings to explore a new methodology for decolonized co-learning processes between health authorities and Indigenous communities. For project updates and more information on other Programmatic Grants to Tackle Health and Health Equity funded by CIHR's Institute of Poplulation and Public Health (IPPH) click here.